Editor’s Note: This is a guest post by Steve Frank, an associate professor of entomology at NC State University. North Carolina is home to 500 species of wild bees, yet only a subset of these are common in cities and suburbs. People encourage wild bees by planting flowers and creating pollinator gardens to provide the pollen and nectar bees need. However, even gardens rich with flowers do not have the same bee abundance or diversity as natural areas. So, there must be things besides flowers that limit urban bee communities. But what are they? In a recent paper, we show that one of these factors is the urban heat island effect. The urban heat island effect is caused by impervious surfaces – like cement and pavement – that absorb heat from the sun, making cities hotter than surrounding rural areas. We sampled bees for two years in 18 yards and parks around Raleigh, NC. These yards differed in flower abundance and diversity, but also differed in temperature. The hottest yards had about a third as many bees as yards just 2°C (about 3.6°F) cooler. In addition, hot yards had fewer bees from species that we previously found to be sensitive to heat and more bees from species we found to be heat tolerant. We know from previous research that high temperatures can reduce bee survival by making them more susceptible to pathogens or less able to forage. Yards with lots of flowers still had more bees and more kinds of bees than yards with few flowers but this was mitigated by yard temperature. In other words, simply adding flowers to otherwise hot sites with lots of impervious surface cover is unlikely to restore pollinator communities. To amplify the benefits provided by flowers, you could plant trees to shade driveways and sidewalks, reducing the temperature of a yard. We wouldn’t expect other animals to thrive in poor habitats just by providing them with food. 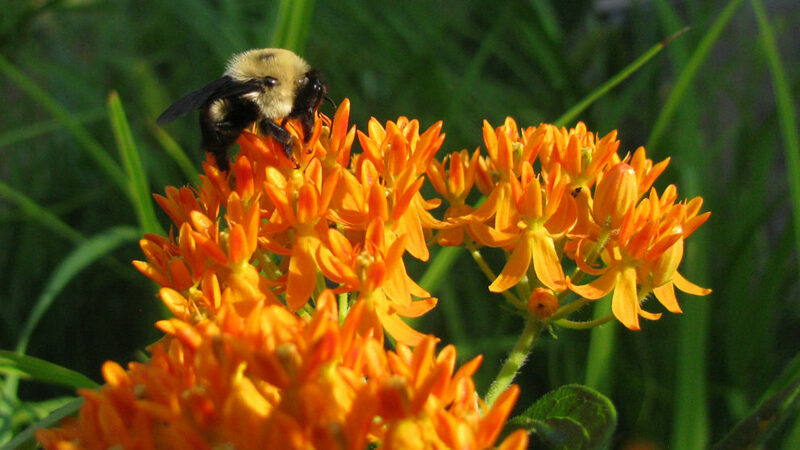 Bee conservation requires habitat restoration. (Another) Editor’s Note: The new paper, “Wild bee abundance declines with urban warming, regardless of floral density,” is published in the journal Urban Ecosystems. First author of the paper is April Hamblin, a research assistant in the Center for Integrated Pest Management at NC State. The paper was co-authored by Frank and Elsa Youngsteadt, a research associate at NC State. The study was funded in part by an Agriculture and Food Research Initiative Competitive Grant (2013-02476) from the USDA National Institute of Food and Agriculture. The work was also funded by Cooperative Agreement No. G11 AC20471, G13 AC00405, and G15AP00153 from the United States Geological Survey.